Secret accounts in Switzerland or the Cayman Islands, invisible to the prying eyes of tax collectors, creditors and future ex-spouses have long been attractive cash magnets for the super rich and even the merely wealthy. But now, for U.S. residents, these anonymous and private accounts have been closed down and probably shuttered for good as the U.S Government battles budget deficits and tax evasion with a renewed and vigorous attack against the bank secrecy havens. During the past three years, a concerted and well focused attack by the U.S. Government against the offshore havens has effectively pierced the previously impenetrable shield of bank secrecy which surrounded and protected a sizable portion of worldwide surplus wealth for more than 200 years. Concerns about terrorism, money laundering and the estimated loss of more than $100 billion each year in tax revenue has spurred the drive to shut down the activities enabled by the bank secrecy havens. Prior to these recent efforts, opening accounts in the European banking centers -Switzerland, Lichtenstein and Luxembourg – with long traditions of strict bank secrecy laws, was a fairly straightforward process. Most banks adhered to at least a minimal “know your customer” standard. Typical due diligence efforts by the banks required proof of residence and citizenship, bank letters of reference and often an introduction from someone within the bank’s referral network of existing customers, attorneys and financial advisors. Beyond these relatively minor barriers to entry, most European banks maintained a minimum deposit requirement ranging from several hundred thousand dollars to well over a million. Notably, the source of the funds for the account deposit and whether the new customer was “tax compliant” in his or her home country was rarely a matter of concern or discussion. Although most of the banks operating in the Caribbean and Central America, in countries such as the Cayman Islands, Bahamas, Bermuda, and Panama adhered to similar standards as their European counterparts, some applied substantially lower minimum deposit requirements. A few were known to be overly welcoming to new customers- with little or no due diligence inquiries to weed out money from a wide variety of illegal activity. Common to all the tax haven countries is a low or no tax regime on investment income and income from sources outside the country. This attractive benefit is combined with strict bank secrecy laws which prohibit disclosure by bank employees and government officials of customer names and account details. These secrecy laws are backed by strong criminal penalties. At least until recently, breaches were rare and exceptions to the rules were very narrowly proscribed. Sometimes the funds of a notorious thieving dictator were frozen to avoid a worldwide outcry. Former Egyptian President Hosni Mubarak and Haiti’s Baby “Doc” Duvalier reportedly had billions tucked away in accounts frozen by the Swiss government. But with these few exceptions the governments and the banks have stood firm. To combat the lure of the bank secrecy countries as havens for tax evasion and money laundering, the so called high tax countries, have applied increasing pressure on the bank secrecy countries over the last five years with some limited success. To avoid an international blacklist, most tax haven countries agreed to a set of standards which provided at least limited cooperation with other governments. Although requests for information about the accounts of particular individuals had been previously denied, faced with the possibility of being shut out of the worldwide banking system, the secrecy countries agreed to limited disclosure to assist in criminal investigations as well as enhanced due diligence in opening and maintaining customer accounts. Since 2009, the United States has forcefully and aggressively expanded its fight against the tax haven countries with a double barrel attack directed at the offshore banks and their American customers. A string of criminal prosecutions together with tough new legislation may have changed the tax haven game forever. Although previous efforts by the U.S. to obtain the names of offshore account holders had been largely futile, a potential criminal case against UBS AG, the largest Swiss bank, unveiled a treasure trove of previously inaccessible and detailed customer information. In brief, the IRS victory was triggered when a UBS wealth manager, an American citizen based in Geneva and in charge of attracting wealthy U.S. customers for UBS, pled guilty to charges of tax evasion for assisting a U.S. billionaire client with avoiding millions in taxes. In exchange for his guilty plea, he testified that UBS routinely encouraged it’s bankers to attract U.S clients by promoting the many tax evasion opportunities available from UBS. According to the testimony, the bankers assisted thousands of customers in hiding and disguising transfers to their Swiss accounts, filing fraudulent tax returns and concealing investment gains and income through a variety of offshore companies and structures. Based primarily on this testimony and mountains of corroborating evidence, UBS narrowly avoided criminal charges with a fine of $780 million and most importantly, an agreement to hand over the names of 250 US clients who had been holding secret accounts at UBS. In addition, as part of the settlement of the case and subsequent cases filed, the Swiss government, agreed to turn over more than 10,000 names of Americans with accounts in at least 11 of the country’s largest banks, including UBS, Credit Suisse and Bank Julius Baer. At the same time as the final settlement was being negotiated, the IRS initiated a voluntary disclosure and amnesty program. Not knowing whether their names would be part of the account disclosure agreement and facing potential criminal prosecution for tax evasion, approximately 19,000 taxpayers came forward with undeclared offshore accounts. Under the terms of the deal, taxpayers coming forward were able to avoid prosecution by paying taxes due and penalties, disclosing details of the offshore accounts as well as the names of bankers and advisers, and information about how they moved their money. Information obtained from these taxpayers is fueling ongoing IRS investigations into the offshore banking world with new charges and indictments occurring on a regular basis. In February of 2012 the U.S. filed criminal charges against Wegelin & Co, the oldest Swiss Bank, accusing it of helping Americans commit tax fraud. The second prong of the government’s attack came in 2010 when Congress passed The Foreign Account Tax Compliance Act (FATCA). The new rules, scheduled to take effect in 2013 require all foreign banks to report details of their U.S. client’s accounts directly to the IRS-regardless of whether such reporting would violate existing bank privacy laws in those jurisdictions. Any foreign bank which refuses to comply will have a 30 per cent withholding tax imposed on all payments received from the U.S. The effect of FATCA is that every foreign bank will have to report the names and account information of all U.S customers to the IRS on an annual basis to avoid having their U.S. business effectively shut down. The combined effect of the bank prosecutions and the FATCA legislation is that the offshore banks have severely limited their dealings with U.S. residents. The expense and administrative burdens involved in reporting names and account details to the IRS, together with the irresolvable tension which compliance would create with local bank secrecy laws, have caused many foreign banks to simply shut the door on all accounts by U.S. residents-even those who can demonstrate that they are fully tax compliant. At many banks, long time depositors have been notified that their existing accounts are being closed and that new customer accounts cannot be opened. On a positive note, the final rules under FATCA have not yet been issued and their legal impact and costs are still being studied. Negotiations between the foreign institutions and the IRS are ongoing and many are hopeful that the rules will ultimately undergo serious modification, easing the most objectionable aspects of the law. Although the offshore world can still be successfully navigated, there is no question that even those individuals who fully report and pay all U.S. taxes will face greater scrutiny and at least some inconvenience in obtaining an offshore account for legitimate asset protection or investment purposes. One question now being raised by a number of legal experts is whether an equal or greater level of asset protection and privacy can be obtained through domestic U.S. accounts in states with favorable laws designed to accomplish these particular goals. 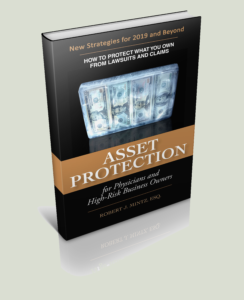 In next month’s column we’ll examine this issue to see what benefits can be offered by state asset protection laws and whether these alternatives can provide reasonable alternatives to traditional offshore planning.